Peter Braun is a dedicated sport and exercise medicine physician. He has over 30 years’ experience treating athletes of various sporting codes, from recreational participants of all ages, to elite professionals. His mission is to get you back to your sport or activity, as quickly and reliably as possible. Whilst you are injured, he will advise alternate forms of training to optimise recovery and maintain fitness. .
At the elite level, his interest in winter sports has taken him to seven Olympic Winter Games, looking after Australia's skiers, snowboarders, skaters, and sliders as medical director and team doctor. His greatest professional satisfaction stems from involvement in medal success and career highlights of his patients. Peter worked at the 2018 Olympic Winter Games in PyeongChang, South Korea as Australian Team Medical Director supporting the Australian Winter Olympic Team. As the CMO for the Olympic Winter Institute of Australia, he is responsible for Sports Medicine and Athlete Support Services, including monitoring of training load and well-being, illness and injury management, rehabilitation, nutrition, strength and conditioning and injury prevention. Policies for management of concussion and supplement use also fall under this role. Dr Braun’s philosophy is that current scientific knowledge forms the basis of treatment decisions. Ongoing education is vital to ensure that current concepts and technologies are guided by objective research. Medical advice is evidence-based, rather than driven by trends and hype. Peter is interested in the health benefits of an active lifestyle and he exercises an hour or more daily. 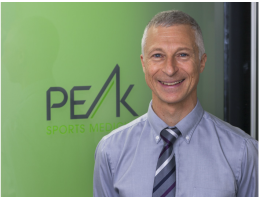 Dr Braun is excited by the opportunities that have arisen since relocating his Footscray Sports Medicine practice to Docklands 6 years ago, and now joining a growing team of enthusiastic specialists at the peak of their professions with the recent move to Absolute Health & Performance in the Melbourne CBD.